I have a packet of lotus paste which is expiring in about three weeks' time. So after running ideas what I want to do with it, I remembered seeing this very pretty flower shape mooncake in Yochana's blog. So that is what I have just baked straight after getting home from work. 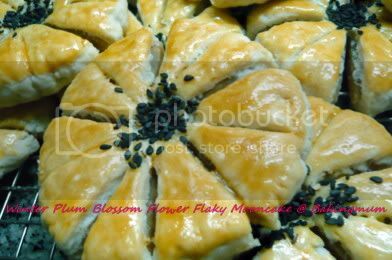 My Winter Plum Blossom Flower Flaky Mooncake. Ain't they pretty. I think I shouldn't have flatten it too much. I think it would have looked better if it was a bit more plump. Anyway, the crust is really flaky and crispy and tasted good. Here is the recipe taken from Yochana's blog for those who are interested in trying for the coming Mooncake Festival. (1) Divide filling into 50 gm. portions and roll into round balls. Set aside. (2) Combine flour, icing sugar and shortening of Water Skin. Add in water and knead into a soft dough. Divide into 16 portions. (3) Combine Pastry ingredients together and divide into 16 portions. (4) Flatten water skin and wrap in oily dough. Shape round and roll into a long strip and roll into a swiss roll. Repeat process one more time. Do the same with remaining pieces. Repeat process till all the dough finish. 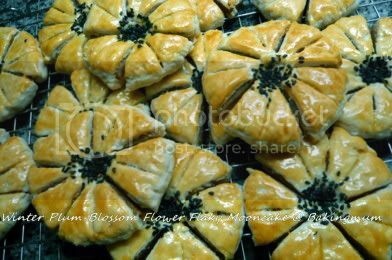 (5) Flatten each rolled dough into a round shape and wrap up with lotus paste. (6) Use a knife or cutter to slit 5 slits leaving the middle part intact. Use your thumb to make a depression in the center. (7) Use the cutter to make some lines on the cut blossom flower. 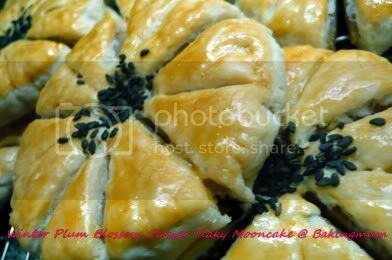 (8) Glaze with egg and sprinkle some sesame seeds in the depression - center of the mooncakes. (9) Bake in a preheated oven at 180C for 20 - 25 mins. Cool on cooling rack. Glads that u r back with ur baking with great receipts cos nowadays luck's blog selfdom post her baking with receipts maybe due to her starting of her baking class and people like me can't afford the time to attend and lose out alot. Hope u hv the time and continue to baking more often. Wow, looks gorgeous, wish I could sink my teeth in them but sounds like a lot of hard work. How do u manage to do after work??? Hi SIG, I am a fast worker. I got all my ingredients ready and that makes it very easy to work fast. Everything was done under two hours. may i check with you what is shortening? am new at baking and would like to try this recipe. Moon, shortening is actually vegetable oil solidified. It is white in colour.